From unexpected crashes to new installations, casual fixes to regular maintenance, we'll get your computer systems back on track. If you need hardware or software we can source quality brands at competitive prices. Streamline your business processes with an application customised to meet your specific requirements. We deliver high performing, stable and secure software. Whether you want to establish a presence on the web, or you need your current website revamped, we can design a solution to suit your needs. Comtek provides fibre based high speed internet access solutions on the Velocity and Ultra Fast Fibre networks in Hamilton, as well as operating our own wireless network across the Hamilton CBD. Contact us for pricing details. We also provice many other internet services ranging from domain name registration to website hosting. 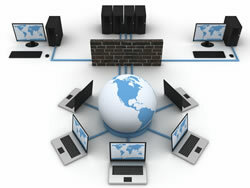 No problem with our VirtualDesk Hosting Service. If you have users that are away from the office, they can connect to the server from any computer with an internet connection, and they will be able to see everything as if they were in the office. Instead of buying and maintaining your own server, we provide you a virtual server that we house in a data centre, and you remotely connect to it. We provide the infrastructure, security, expertise and support required so that you can have premium IT systems and access them from anywhere. We look after all of the hardware, the software, data and documents, email, and daily backups. With that taken care of you can concentrate on what you do best – running your business.